Dental Health Services Victoria (DHSV) operates in a diverse environment and is proud of its staff and patient diversity. Our patients and staff are representative of the Victorian community with a mix of abilities, cultures, ages, gender, religions, ethnicities, sexual orientations, physical attributes and levels of education. DHSV recognises and values this diversity and endeavours to respond to people’s needs in a culturally competent manner. Integrated community consultation DHSV consults with patients and the Victorian community on the way services are provided and our strategic goals for the future. Our Diversity and Community Participation Plan 13-15 involves our communities in the formation of our policies and strategies. Staff involvement DHSV staff from all levels are encouraged to actively participate in community consultation activities. 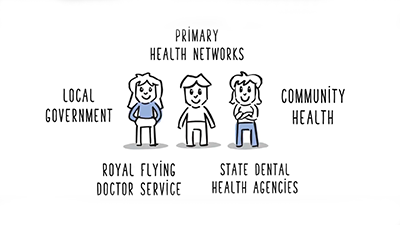 DHSV committees and working groups include consumers and carers from a variety of backgrounds. The Community Advisory Committee (CAC) deserves a special mention. As a sub-committee of the Board of Directors, the CAC provides advice to the Board on issues that may affect the community and keeps a close eye on how DHSV’s community consultations and recommendations are implemented. Particular attention is paid by the CAC to the needs of disadvantaged and marginalised communities. Roundtable forums have been used by the Community Advisory Committee since 2006 to consult with groups within the Victorian community. They assist in developing new services and provide the Committee with an overview of trends and global issues. The first roundtable explored the oral health needs of Aboriginal people. As a result, DHSV created an Aboriginal Community Development Worker position to assist with access for indigenous clients. The second roundtable explored the oral health needs of older Victorians. Several projects stemmed from this, including the development of targeted oral health promotion tools for older Victorians and their carers to use. The 2009 roundtable explored how the CAC can best support Community Dental Agencies and their patients. One of the projects supports agencies to promote oral health as an integral part of general health. 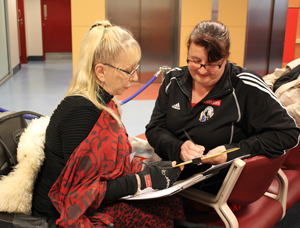 DHSV held its first waiting room consultation exercise in 2010. Patients were asked about the kind of oral health information they would like to receive and how they would like to receive it. The exercise gathered some valuable information which is being incorporated into a larger project on oral health literacy. In 2012 we asked patients how we could make the hospital more welcoming. The suggestions we received were used in a number of exciting projects, including a signage upgrade for clinical and waiting areas, improvements to our call management systems, and changing the way our customer service areas operate to improve the experience for patients. In 2013 we asked patients what they thought of our new electronic feedback tool, the Patient Experience Tracker (PET). The PETs contained five multiple choice questions on how contact us and access services. Patients found the PETs quick and easy to use and said they would also give feedback on our website, use a feedback form or talk to staff if they had more to say. Patients were keen to see some questions about treatment on the PETs, which would be introduced later in the year. This poster describes the experience of a community representative on the project’s working party panel. This poster looks at the development of DHSV’s services using a Population Health model. Local people partnering with community organisations to find solutions to rural community health challenges. Culturally and Linguistically Diverse Communities - Resource Kit This kit includes information on how to work effectively with people from culturally and linguistically diverse backgrounds. Disability Awareness GuideThis guide includes advice and information to work effectively with people with a range of disabilities.